14:2 Leading priests and the Jewish scholars called scribes were trying to figure out how they could bait, arrest, and execute Jesus. 14:3 Jesus was in Bethany3 at the time, at the house of a man known as Simon the leper.4 Jesus was reclining5 at the table. A woman came in with a jar crafted from alabaster stone and filled with nard,6 an expensive perfume. She broke open the flask and poured the perfume onto the head of Jesus. 14:4 Some in the room got angry about this. They said to themselves, “Why waste this expensive perfume? 14:5 This perfume could have been sold for enough money to cover almost a year’s salary.7 She could have donated that to the poor.” The people viciously scolded this woman for what she did. 14:6 Jesus said, “Back off and leave her alone. Why are you giving her a hard time? What she just did for me is beautiful. 14:7 Look, you’ll always have poor people you can help. You can do good things for them whenever you want to. But you’re not always going to have me. 14:8 This woman has anointed my body for burial. She did what she could for me. 14:10 At that point, Judas Iscariot, one of the 12 disciples, slipped out and went to see the leading priests. He started helping them orchestrate the arrest of Jesus. 14:11 The priests were delighted when they found out Judas wanted to help them. They were so happy that they promised to give him a reward. From that point on, Judas began looking for an opportunity to arrest Jesus. 14:13 He told two of his disciples, “Go into town. A man carrying a jug of water will meet you there. Follow him. 14:16 So the disciples left and went into town. They found everything just as Jesus had described. They set up the Passover meal. 14:17 That evening, Jesus and the 12 disciples came for the meal. 14:20 Jesus said, “It’s one of you 12—the one dipping his bread in the bowl with me now. 14:23 Then he picked up a cup of wine and said another prayer of thanks. He handed the wine to one of the disciples, who took a drink and then passed it on to the next disciple. They all drank from this cup. 14:24 Jesus told them, “This is my blood. It will establish God’s new agreement with people.8 My blood will be poured out for many. 14:33 Jesus took with him Peter, James, and John. Jesus was getting upset, even terrified. 14:35 Jesus walked on a little further to be alone. He fell to the ground and prayed that he wouldn’t have to go through what was coming, if at all possible. 14:39 Jesus went off by himself again, praying what he had prayed before. 14:40 Once again he walked back over to the disciples. And, again, they were sleeping. They were too tired to keep their eyes open. When Jesus caught them asleep, they had no idea what to say for themselves. 14:41 The third time Jesus came back to check on them he said, “Still sleeping? Getting your rest? You think we’ve got lots of time? Time’s up. The Son of Humans has been betrayed and is about to get arrested by sinful people. 14:43 Jesus was still talking when Judas, one of the 12 disciples, showed up. He came with a crowd carrying swords and clubs. They were sent by Jewish leaders: top priests, scholars called scribes, and the elders. 14:45 Judas walked right up to Jesus and said, “Teacher,” greeting him with a kiss. 14:46 People with Judas grabbed Jesus and arrested him. 14:48 Jesus said to the crowd, “Why have you come out here with swords and clubs to arrest me like I’m some kind of a dangerous robber? 14:50 The disciples scattered. They all ran away. 14:51 One young man wearing nothing but a linen cloth started to follow the group taking Jesus away. The people tried to arrest him, too. 14:52 But the young man managed to slip away, leaving behind the linen cloth, and running naked into the night. 14:53 The arresting crowd led Jesus to the high priest. Top Jewish leaders quickly put together a meeting of the leading priests, scribes, and elders. 14:54 Peter followed from a safe distance, eventually joining others waiting outside in the courtyard of the high priest. He sat there alongside Temple guards, warming himself by the fire. 14:55 The high priests and the entire Jewish Council16 convened to hear the case against Jesus. They scrambled to find people willing to testify against Jesus because they wanted to execute him. But they couldn’t find any credible witnesses. 14:56 Many perjured themselves by telling lies about Jesus. That became obvious because the witnesses contradicted each other. 14:59 But even those folks couldn’t get their story straight. 14:63 Livid, the high priest ripped his clothes.19 he said, “Why waste our time with more witnesses? 14:64 You have all heard him slander God with this blasphemy. What are you going to do about it?” The Council sentenced him to death. 14:65 Immediately some of the men spat on him. Others blindfolded him, punched him in the face, and told him, “Prophesy that!” Even the guards slapped his face. 14:66 While all this was going on, Peter was outside in the courtyard below. One of the maids who worked for the high priest came over to him. 14:68 Peter denied it. “Lady, I have no idea what you’re talking about. I don’t know that guy.” Peter got up and walked over to the entrance into the courtyard—just in time to hear a rooster crow. 14:72 At that very moment the rooster crowed a second time. That’s when Peter remembered what Jesus had said to him earlier: “Before this night is over and before the rooster crows twice, you will deny that you ever knew me. And you’ll do it three times.” Peter began to sob. Jews call this holiday by its Hebrew name: Pesach (PAY sah). More literally: Festival of Unleavened Bread. This was flatbread made with no yeast. Yeast is what makes bread dough rise. Many Jews today celebrate the holiday by eating cracker-like matzo. Tortillas would also qualify. The festival is a seven-day celebration beginning on the 14th day of the first month in the Jewish new year: Nisan, usually sometime in March or April. It varies because the Jewish calendar is based on the cycles of the moon, from one full moon to the next. Bethany was a village on the eastern slopes of the Mount of Olives, about two miles (3 km) from Jerusalem—a short walk. Luke’s version of the story (Luke 7:36-50) reports that Jesus was invited to eat in the home of a Pharisee. Tables were often low, much like coffee tables today. Instead of sitting on chairs, people sat on the floor beside the table. Nard, which has the earthy fragrance of cyprus, was one of the most expensive perfumes and anointing oils available. Nard was extracted from spikenard plants native to India’s Himalayan Mountains, some 2,500 miles (4,000 km) east of what is now Israel. It took about a year’s salary for the average working man to buy a flask of 16 ounces (.5 l). Mark quotes the complainers as saying the perfume was worth 300 denarii. A denarius was commonly considered the daily salary of a worker. More literally, “This is my blood of the covenant.” It’s phrased in a way that would remind Mark’s readers of what Moses said after he splashed blood on an altar: “This blood confirms the covenant the LORD has made with you” (Exodus 24:8 NLT). See footnote for 13:20. More literally, “until that day when I drink it new.” Bible experts seem baffled by why Mark inserted the word “new.” Some guess that Jesus was talking about new wine. Others guess that he was saying the next time he drank wine he would be the new Jesus, resurrected. The Mount of Olives was just a few minutes away. 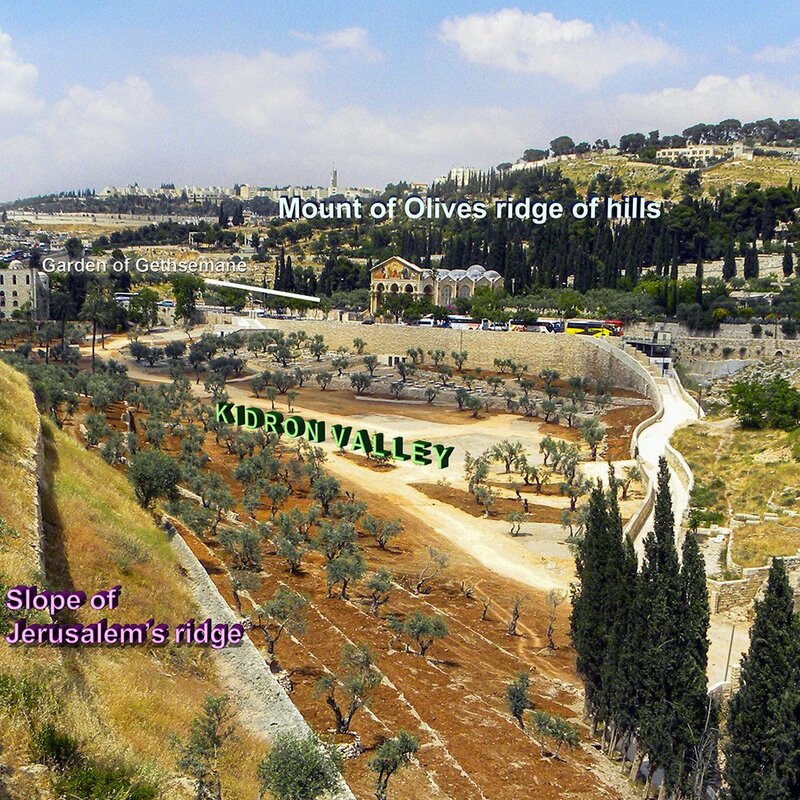 It’s a ridge of hills parallel to the ridge on which Jerusalem was built. The narrow Kidron Valley separates the two ridges. “Gethsemane” means “oil press.” In the fall of the year, farmers harvested olives from olive trees, and then crushed most of the olives to produce olive oil. A few olive trees and ruins of an ancient olive oil press are located on the lower slopes of the Mount of Olives. “”My heart is in anguish within me, And the terrors of death have fallen upon me. Fear and trembling come upon me, and [a] horror has overwhelmed me” (Psalm 55:4-5 NASB). Peter was the swordsman according to John 18:10. It’s unclear what prophecies Jesus meant. Perhaps he had in mind the scattering of the disciples that he mentioned in 14:27. This is the moment most of them scattered. Among many other prophecies Jesus may have had in mind, there’s Daniel 9:26, “The Anointed One will be killed, appearing to have accomplished nothing” (NLT). This council was known as the Sanhedrin. They were a group of 70 Jewish leaders led by the high priest. They functioned as the top legislative and judicial body among Jews. They were a bit like a combination Congress-Supreme Court. They made the laws and they punished the people who broke them. They did not, however, have the authority to execute anyone. The Roman occupiers kept that authority for themselves. More literally, the high priest asks Jesus if he is the “son of the Blessed.” “Blessed” is a respectful way of referring to God. The high priest may not have been asking Jesus if he was the “Son of God” as Christians today understand that phrase, now associated with divinity. Many Jews taught that the promised Messiah would be a descendant of David who was described as a son of God, “The LORD said to me, ‘You are my son'” (Psalm 2:7 NLT). This description applied to the coming Messiah, too. David’s descendant will also “be my son” (2 Samuel 7:14 NLT). “I AM” was one of the names associated with God. When God told Moses to go back to Egypt and free the Jews from slavery, Moses wanted to know who he should say sent him. God told him to tell the people of Israel, “I AM has sent me to you” (Exodus 3:14). Today, someone that upset might punch a hole through the drywall. One difference might be that punching a hole in the drywall is not considered acceptable or intelligent. But in ancient times, ripping clothes was a conventional way of expressing anger or grief. Galileans had a northern accent (Matthew 26:73). While Jesus was eating a meal at Bethany, Mark says a woman came into the house carrying an alabaster jar “filled with nard, an expensive perfume. She broke open the flask and poured the perfume onto the head of Jesus” (14:3). Mark doesn’t say why she did this. What might be some possible reasons she would have emptied onto Jesus a jar full of perfume worth a year’s salary? In defending the woman who anointed him with extravagantly expensive perfume, Jesus said, “Back off and leave her alone… Look, you’ll always have poor people you can help” (14:6-7). How is that not selfish and insensitive of Jesus? Mark’s story about two disciples preparing the Passover meal begins with a bit of mystery. Jesus tells the two men to go in to town and follow “a man carrying a jug of water” (14:13). The man led them to a house where the disciples were to simply tell the owner that “the Teacher” wants to know where the guestroom is so he and his disciples can eat the Passover meal. The story sounds a little like the instructions Jesus gave disciples to go find a donkey he could ride into town (Mark 11:2). Does it sound like Jesus had made these plans ahead of time? Or do you think the homeowner recognized who the Teacher was, and decided to accommodate him? When Jesus passed out pieces of bread to the disciples he said, “Take this. It’s my body” (14:22). Luke adds this: “I’m giving it for you—for your sake. When you do this, remember me” (22:19). Was he talking about what became the ritual of communion or Mass? Or was he talking about any time we eat a meal? When Jesus gave his disciples the bread at the Last Supper, he said, “It’s my body” (14:22). Really? His actual body? Many Christians argue that the wine and the bread served during Communion or Mass are miraculously transformed into the actual blood and body of Jesus. Other Christians say the wine and bread are only symbols. What do you think about that? Jesus said “I won’t drink wine again until I drink it renewed, in God’s Kingdom” (14:25). What do you think he was talking about? Could he have been talking about after his resurrection, since the Bible says he ate fish afterward and perhaps drank wine as well (Luke 24:41-43)? Or do you think he was talking about end times, after his Second Coming? Mark doesn’t say what motivated Judas to betray Jesus. Luke says that “Satan got inside the head of Judas” (22:3). Other Bible versions translate it as “Satan entered into Judas” (NLT). What do you think happened? Did Judas become demon possessed? Or did Satan simply plant an idea in the mind of Judas, and Judas embraced it? Let’s say Judas was not demon possessed, and that Satan merely tempted him to do something he had been considering. Do you think Judas hoped to force Jesus into a public confrontation with Jewish leaders who supported the Roman occupying army, so the Messiah could lead Jewish rebels to freedom? Or do you think he had some other motive? Jesus told his three closest friends, Peter, James, and John, “I’m so afraid. It’s crushing me, and I feel like I could die” (14:34). Then he prayed by himself, “Papa. Father. Nothing is impossible for you. Please, don’t ask me to go through this. But if you do, I will” (14:36). What do you think this reveals about Jesus? Jesus told the disciples to pray for themselves: “Pray that you won’t be tempted. The spirit wants to do what’s right. But sometimes the body is too weak to do it” (14:38). Luke reports it this way: “Pray that you won’t be tempted to do something you know is wrong” (22:46). What do you think Jesus was talking about? What might they have been tempted to do that was wrong? Why do you think Judas chose a kiss as the signal to arresting officers that Jesus was the target (14:44)? As Mark tells the story, Jesus was his own worst enemy at his trial before the Jewish Council. He was quickly convicted of blasphemy against God when he answered the high priest’s question “Are you the Messiah, the son of God?” (14:61). It’s not clear if the priest was asking if Jesus was the divine Son of God, or merely a child of God. But Jesus made it clear that he was on awfully good terms with God: “One day you will see the Son of Humans sitting at the right hand of God Almighty. Look to the clouds in the sky because that’s where I’ll be coming from” (14:62). If you had been a member of the Jewish Council, and you proposed releasing Jesus because he is obviously a bit crazy, what counterpoints would you expect to hear? What do you think most people feel when they read the story of Peter telling people he didn’t know who Jesus was (14:66-72)? Do they think less of him? Do they pity him? Do they relate to him? LIFE APPLICATION. Some people at the dinner Simon hosted in Bethany complained about the woman who poured perfume onto Jesus. It was worth a year’s salary and they thought the money would have been better used by donating to the poor (14:5). What do you think would be some examples today of spending money on something that others might say is a waste because it could have been donated to the poor and better used there? LIFE APPLICATION. When Judas betrayed Jesus, some Bible writers says he did it because Satan somehow got inside of him (Luke 22:3). Humans do evil things all the time. Do you think it’s because Satan is inside of us? Or is something else going on to make us do those terrible things? LIFE APPLICATION. All of the disciples ran away when Jesus got arrested, just as he predicted they would (14:27). At the end of the story, Jesus forgives them, as well as his executioners. Without giving any names, how have you seen people react when they felt abandoned by the people they counted on most?